Smooth, sun-kissed summer squash. Crispy cucumbers. Billowy leaves of rainbow Swiss chard. Sure, they sound lovely, but have you tried dealing with 10 or 20 pounds of them every week–in a household of one? Figuring out what to do with all of this takes a huge bite out of my daily spark of creativity–creativity I would like to apply now and then to other pursuits, such as writing. And to my day job that, you know, is going to pay the bills come fall. Serves 4 to 6. Serve warm or chilled. In a large saucepan or small stock pot, heat olive oil on medium-high. When oil is hot, add the leek or onion and sauté until slightly browned (about 5 minutes). Add zucchini and/or yellow squash and continue to sauté until also browned (If after a few minutes the caramelization doesn’t materialize, just proceed to the next step. You may be dealing with a high water content in your squash). Add stock or water, cover, and reduce heat to a simmer. Simmer for 10-20 minutes, until squash is soft. Using an immersion blender or food processor, puree the soup. Add more stock or water if you need to thin it. Return the soup to the pot and add the dill, buttermilk, and salt and pepper to taste. To serve hot: Reheat on medium just until the soup is steaming. Do not boil. Serve immediately. To serve chilled: Refrigerate for at least 3 hours, then serve. *Buttermilk comes in quarts, which you quickly learn is a large volume of sour dairy product to deal with. So be sure to make both the soup and the following recipe for zucchini bread or muffins. Buttermilk also works beautifully in smoothies, providing both the tartness of yogurt and the thinning qualities of regular milk. Throw in those pesky seasonal peaches and plums. The Best Zucchini Bread [or muffins] Ever from Simple Bites – Plenty of cinnamon and just the right amount of dark chocolate make this a winner. It also relieves the baker of a whopping 2 1/2 cups of grated zucchini. Instead of making a loaf, I say go for convenient, quick-baking muffins all the way. The recipe makes two dozen. 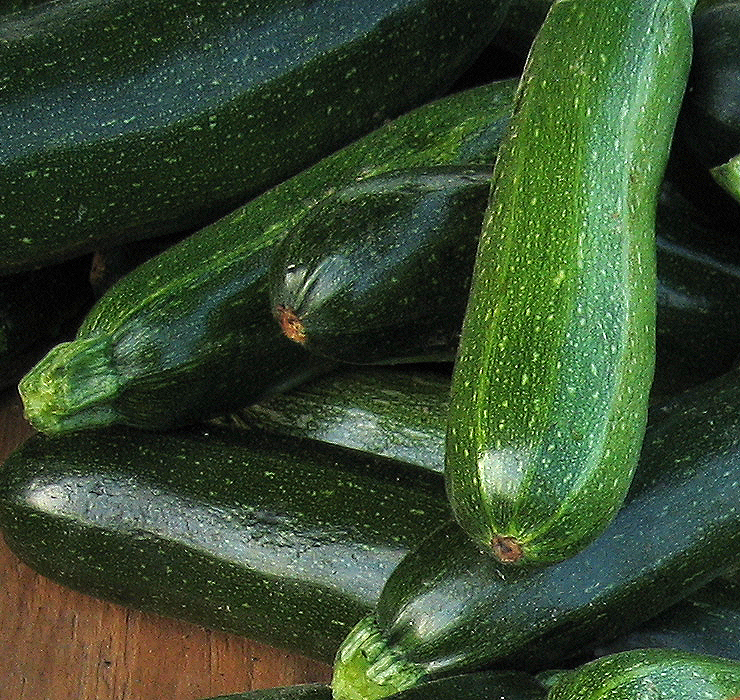 Sautéed Zukes – Does it count as a recipe if you can express it in fewer than 140 characters? Mango Tomato blogger Olga Berman answered my Twitter plea for zucchini inspiration with: “…lately I’ve just been cutting them into circles and sautéeing for about 3-5 min on each side in olive oil + salt.” I can’t tell you if it’s official, but I do know it comes out delicious. The same works for sliced okra. Liang Ban Huan Gua (cold cucumber salad) from my Examiner.com days – A simple, quick salad that reminds me of a good half-sour pickle. Chard chips from Snacking in the Kitchen – This is the non-brassica cousin of the trendy and addictive kale chips. Coincidentally, this blog is written by Olga’s twin sister, Anna. Swiss Chard Pancakes from America Public Media’s The Splendid Table – Also known as farçous, these savory quick breads look delicious. I haven’t tried them yet, but I should be able to spare a few chard leaves for testing.